This is our affordable Mr. France United Nations Day costume for 2012 celebration. It is now available for sale, rent and customization. Made from satin fabric. Price for complete set is Php 699.95. Available in all ages for kids / children both boy and girl (no display yet / different price) and also for prep, nursery, kinder, elementary and high school students. Requests for adult size is also available but only for custom make. Chaleco vest is available in colors: green, red, yellow, blue, violet and black. 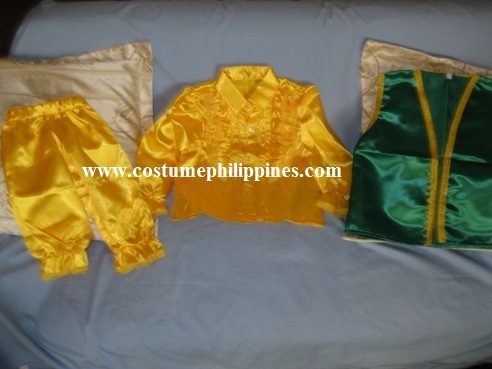 May be ordered in separate (chaleco only, upper costume only or pants only) (See pricing below). For rent needs, custom costume needs, please call or text us at 3663645 / 0932 8725532 (Sam) / 0932 4962980 (Lori) / 0927 3125532 (Ana) or visit our home office in Caloocan City – 136 Bayani Street near R. Papa. For directions, please follow this: Best drop off point is in R. Papa LRT station. Look for the tricycle terminal and take a ride to Bayani Street. Tell the trike driver to drop you off to the 3rd post (poste) from the corner or C.Namie and Bayani or to Purelife Aqua – Water Refilling Station (Astorga Street). From here, walk about 5 meters to the next eskenita poste or ask from the tambays or tricycle terminal in Astorga corner where Sam and Ana residence (Baja Compound) is. Again, it is just an eskenita away from the water station. When inside the compound eskenita, ask any you come across with where Sam and Ana house is. We require 50% payment (non refundable) before any deliveries or pick up of any of our costumes so please see first what you are buying and we suggest that it is best if you come over in person or rely on our photos here of the UN costumes et al. You can pay via bank if you wish not to come over in our home office but again, we don’t allow refund for all or any of our products and services. Shipping and delivery for outside Metro Manila is accepted but will be charged accordingly as per LBC, DHL package sending fees and charges. This entry was posted in Occasions and tagged france un costume, un costume, un costume boy, un costume girl, united nations 2012, united nations costumes, united nations france. Bookmark the permalink.